Hubert Keller, a native of France’s breathtaking, eastern-Alsace region, caught the attention of some of the country’s finest chefs at just sixteen. Towering, innovative culinary artisans like Paul Haeberlin, Gaston Lenôtre, Paul Bocuse and Roger Vergé recognized his promise early on, training him in their kitchens and nurturing his talent. When chef Keller and wife Chantal moved to San Francisco in 1982 to open 500 Sutter restaurant at the behest of Roger Vergé, their love for the city was immediate! In 1986 with partner Maurice Rouas, they opened their flagship restaurant – Fleur de Lys – that quickly became recognized as one of the most exciting, fine-dining establishments in the United States. For the past ten years, chef Keller’s dynamic and artistically-uncompromising creations have been flawlessly accompanied by a broad, yet meticulously focused, beverage program developed and overseen by wine director, Marcus Garcia. Through their shared love of food, wine and music, Garcia and Keller have together managed to create near-perfect harmony for over a decade. I recently sat down with Marcus Garcia to discuss his take on wine, his passion for music and his role as wine director at one of San Francisco’s most beloved dining destinations. SlaveToTheGrape: Given the symbiotic relationship of haute cuisine to fine wine, can you evoke a recent pairing that was particularly harmonious and describe what made it so successful? Marcus Garcia: We recently did a Petrale Sole with a sea urchin, crab bisque, pork belly brioche with caviar and Dungeness crab legs. We have some fantastic wines that are paired with that. Usually with the wine list we have an A, B, C for each dish so there’s a progression. Someone could follow the Sole with Grand Cru Reisling with texture or a dry, domestic Riesling – we have one currently from Napa that is unusually Old World in style. There’s also an element of salinity and a savory element that pairs well with sweet wines. So, they could very well have a Viognier like one we currently have from Mt. Veeder with a couple of years of bottle age that shows like a Condrieu with stone fruit and a little residual sugar. Master of Ceremonies, Marcus Garcia. The point becomes, that if you’re having the Sole and then transitioning to a dish that also goes with that sweeter wine then we try to find a textural, dry white wine with minerality that goes with the Sole so that you have a progression of richness with the wine pairing. That way you’re starting with something that’s fresh on the palate, that evolves and allows you to pick up certain dynamics from the pairing so that when you get to the next wine you feel like you’re still on a crescendo, progressively going from richer to fuller. Periodically I put a stop to that with the cheese course. Sometimes with the cheeses that are so rich, you may have just had a Bordeaux or a Crozes-Hermitage or a domestic Cabernet and then you get into the cheese course. We will often have our guests continue to enjoy the same wine with the cheeses and throw in a sticky wine like a Rousanne or Sauternes. That way, they can see that two wines that are completely different from one another can work, depending on the accoutrements from dried cherries and figs, to salted almonds and pistachios, etc. All of those little items on the plate bridge the pairing, bringing the food and wine together. STTG: What would you say are some of the more exciting trends or developments in the world of wine today? MG: Staying local, I think the wines in California are better than they have ever been. Alexander valley, Russian River valley and a lot of the Sonoma wines are competing globally based upon Bordeaux, Burgundian and Rhone varietals – there’s some good traction there. There are some really fantastic red wines from Germany. The ripeness is unusually full for a cool climate and I’ve tried some wines recently that have really impressed me. New Zealand is putting forth great Sauvignon Blancs and Rieslings and the Pinot Noir wines are better than they have ever been. In addition, there are some smaller appellation wines in France. People have a tendency to think of the expensive wines when they think of French wines like Grand Cru Burgundy and top Bordeaux. Cru Bourgeois and Bordeaux Supérieur represent most of the fine, affordable wine in the world. People are just getting to know these wines. You see a lot of great values out there. There are many vinification trends as well that promote sustainability and a less-is-more approach. Winemakers are employing practices like whole cluster and stem inclusion to achieve more vinosity in the wines along with less new oak that makes for fresher, more vibrant wines. Devices like the Coravin have also changed how we enjoy and appreciate wines. STTG: Which producers and/or other wine personalities have inspired your journey? MG: I think about the classics in California – Mondavi, BV for example; Christian Moueix in Bordeaux, what’s happening up in Oregon with Ken Wright, Agustin Huneeus in Chile. I usually don’t like to mention producers because there are too many great people and so many different influences. I always look at the wine first and then the producer. I look at the wine first and the place afterwards. I look at the wine first and then the vintage. When all is said and done, I ask myself if the wine is a good example of what the wine should taste like from the producer in question, from its place of origin for the vintage at hand. I try to be very pure to the wine itself, not knowing what all those variables are. Then, when I put them together, I ask myself if I am impressed with the wine because it’s so-and-so’s wine from a great vintage, at a given price point, from its place of origin or not? For me, when I’m tasting wine for the program, although the personalities behind the wine make a difference to the consumer – and of course I want to sell wine so it makes a difference to me and to the restaurant – I try to do my due diligence by looking at the wine first, purely for what it is. STTG: What gives you the most pleasure in your role as wine director at Fleur de Lys? Hubert K. & Marcus G. – Rockin’ The House! MG: The biggest pleasure for me in this role is to work closely with a great chef, taste the best of wines – be they obscure or classic – and have my own, personal evaluation of what I think is exciting to put forward for the guests that come in. I’m the instrument through which a bit of happiness is proffered to them. That is always going to bring me the most joy in this business. You have the knowledge and the opportunity to taste and you can therefore convey your enthusiasm about a new discovery or a classic wine that you’ve recently tasted and you’re able to offer them a great experience and create wonderful memories for them. STTG: Finally, you are not only a highly accomplished wine professional but a talented singer and saxophone player as well. If I could borrow a notion from the universe of music for a moment, in a few words, what is it about the world of fine wine that has struck such a richly resonating chord with you over all these years? MG: I love music, I love history, I love art. That’s why wine makes sense to me. That’s why Slow Food makes sense to me. I feel like when I was in my twenties I had to make a trade off and get a regular paycheck but I wanted to do something that I loved doing. 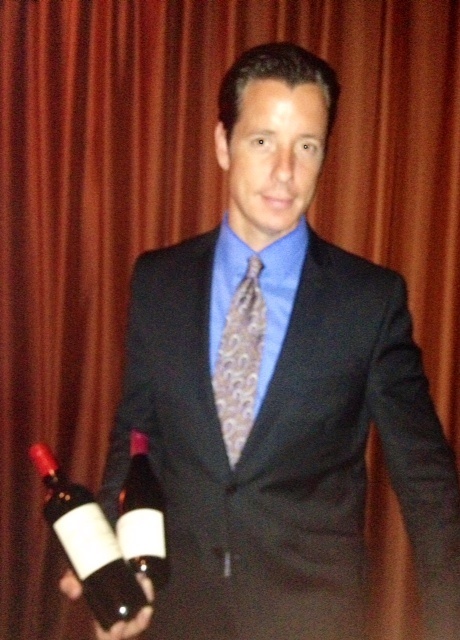 I realized that I loved selling wine, talking about wine and pairing wine with food. I discovered early on in blind tastings that I was privileged to be invited to, that I had an aptitude for it and so I pursued it. I knew that it was more consistent than playing sax in a smoky jazz bar. As much as I respect the art of music and the idea of never giving up on a dream, I feel that I’m lucky to be living a dream right now. Because I was a young father, I had to make a decision to put the music on the back burner. I still play today. It’s great for me to work with a chef-owner who also has a love for music. Many people don’t know that Hubert is a very talented drummer and has become a very well-respected DJ, having played with some of the biggest names in Vegas and San Francisco. 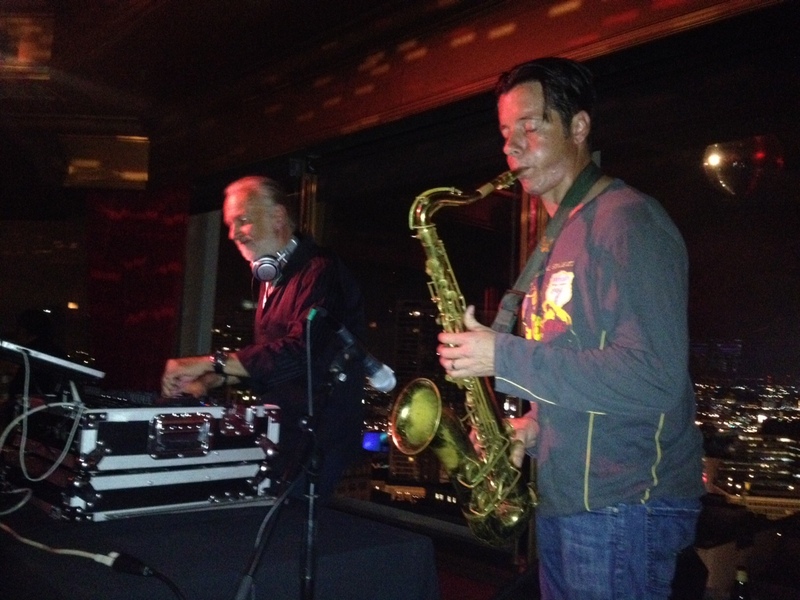 We gig together live as well where I improvise on the sax as Hubert spins some great music. We take this spirit to the floor with us every night at the restaurant. Chef creates amazing, artistic dishes and I try to come up with a blend of both unique and classic pairings with the goal of bringing excitement and balance to whatever dish he’s putting out there. So yes, I think we have a very clear tie in with what we do musically together and where we are as restaurant professionals. « Marcus Garcia – Striking The Perfect Chord!